Januaryâ€™s freezing wind blew into Kansas City more than a handful of interesting art shows, most of which fit into a conversation concerning the correlation between pictures of things and picturesque things. 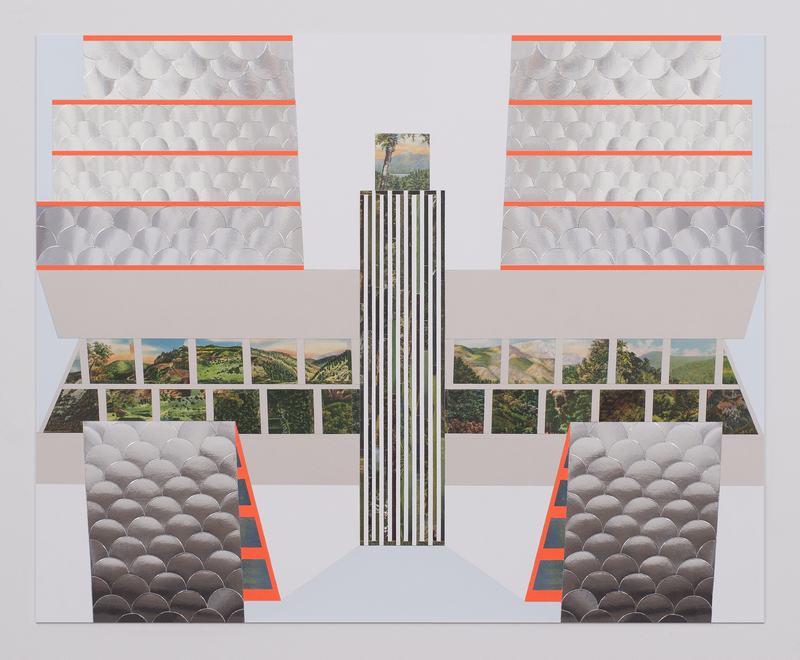 Six of these recent exhibitions feature crossbred sensibilities of both flat and dimensional work, seemingly split halfway along either side of a conceptual MÃ¶bius strip. At City Ice Arts hang several of Miles Neidingerâ€™s drawings and mixed-media assemblages. The showâ€™s center of gravity is The Anatomy of the Palace of Wisdom, a creature-like storm of various vibrant plastic line-segments. Spanning the 20 or so feet from the ceiling to its sedan-sized footprint, the piece is definitely a sculpture in its verticality and volume. But Neidinger says he wishes we would consider beauty, rather than architecture; with that logic,Â Anatomy could also be thought of more like a canvas laid on its back, with frantic, sparkly brushstrokes swooping up into the room like an animatedÂ de Kooning. Miles Neidinger, “The Anatomy of the Palace of Wisdom,” 2014. Photo courtesy of City Ice Arts. Up-and-coming ceramicists with work in OBJET, a â€œpop-up boutiqueâ€ at Charlotte Street Foundation’sÂ Paragraph Gallery + Project Space (part of the organization’s Urban Culture Residency Program), extrude along three axes not just composite gestures but actual, concrete things. Assembled by Dean Roper (curator of Weed-Craft), OBJET is e-relevant, with a second-life on tumblr launched promotionally before the showâ€™s opening and outlasting it as a form of documentation. This in particular raises the big question (especially applicable to the physically remote â€œsilicon prairieâ€ of Kansas City): What is the value of the-real-deal next to its likeness? Around the room, a squiggly Kid-Pix-plus-crystals aesthetic comes to life, displayed on minimal, geometric structures reminiscent of web-design. But internet architecture aside, these artists are paying homage to the way printing (in both dimensions) has revolutionized the craft industry. Take any of Joey Watsonâ€™s funky, futuristic Dope on a Rope necklaced rapid-prototypes, or shirts by Jennifer Wilkinson, featuring previously made and found objects flattened into digital images on fabric, which is then tailored and wrapped around the body like an IRL displacement map. Jennifer Wilkinson in her shirt from “Elsewhere.” Photo courtesy of the artist. In the larger of Haw Contemporaryâ€™s galleries, Del Harrow from Colorado also shows a spread of digital-come-ceramic work in Breath. There is a CAD-plotted drawing that flattens the many evolutions of a CNC-lathed vase. But at the back of the room sprawls the showstopper: an assembly of many organic and geometric forms that Harrow calls a â€œstill-life.â€ Motifs from some of the scenic arrangementâ€™s discrete objects are echoed in the structural â€œmorphologyâ€ and surface treatment of others, like in one brilliant detailâ€”a tiny slice of leafy shadow cast in gold paint, barely visible on the side of a giant Lemonhead. This sort of inter-object contingency forms a scenic, pictorial stew of three-dimensional abstract harmony. Del Harrow, “Still Life,” 2014. Photo courtesy of Haw Contemporary. 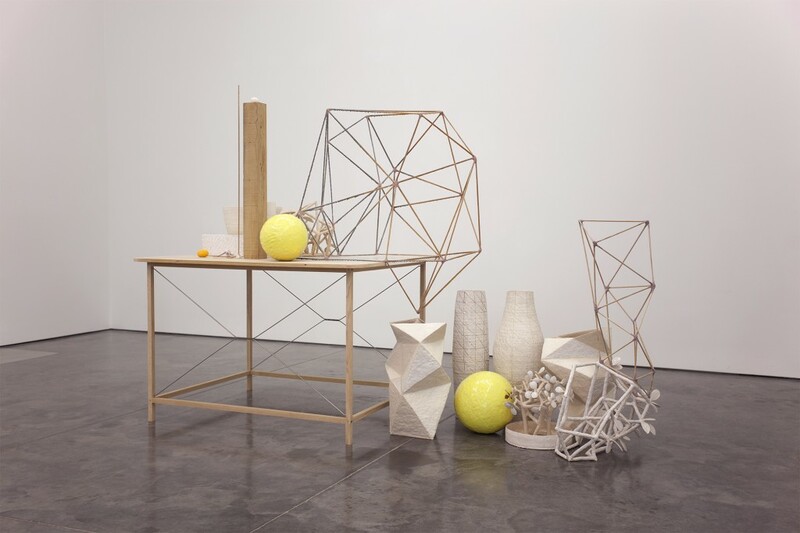 As seems customary, Haw Contemporary features two concurrent shows. The doorway between them begins our MÃ¶bius twist into imagistic territory. 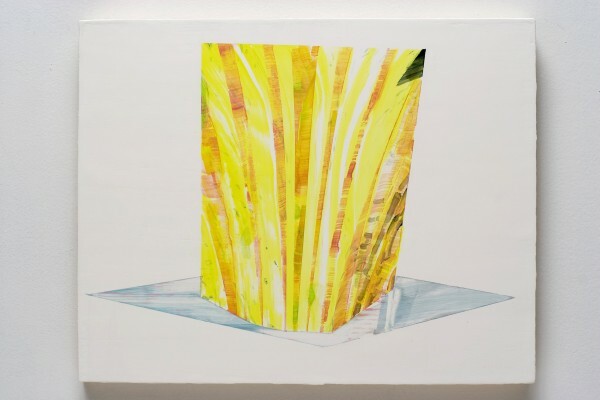 Corey Antisâ€™ The Head on the Door presents mostly small paintings of wonky, boxy forms. Antis, who believes perception is â€œmeasured between the solidity of material and its image,â€ plays a game with â€œtwofoldness,â€Â where a painting is both a material plane and a representational portal. But his works are glitchy portals, residing in paradoxes of contradictory spatial cues. Take one of Antisâ€™ â€œproposals forâ€¦perception,â€ like Untitled (Demo), where the void of the panelâ€™s white ground corrugates the sunnily stripy pattern of something seemingly solid. In the end, of course itâ€™s an image of that wedge-ish thing, whatever it is…sort of. Corey Antis, “Untitled (Demo),” 2013. Photo credit Clear Bright Matter. Inferable by the title of the ongoing SPECTRA film seriesâ€™ exhibition, Sculpties, guest-curated by artist David Rhoads, the five videos in the H&R Block Artspace gallery show us scenes of objects and phenomena, aimed at an experience â€œcloser to sculpture than film.â€ Here, rather than as a narrative vehicle, time functions as motion in space. Rhoads shows all the work at once in a considered layout, instead of in typical â€˜screeningâ€™ format. Two painterly collaborative videos by Robert Heishman and Megan Schvaneveldt, who live and work inÂ Chicago, are shown back-to-back on large flatscreens. The artists puppeteer colorful, textural materials and symbolic objects within a shallow depth-of-field,Â compressing props, natural forces like wind and gravity, and their own personas into dynamic images. 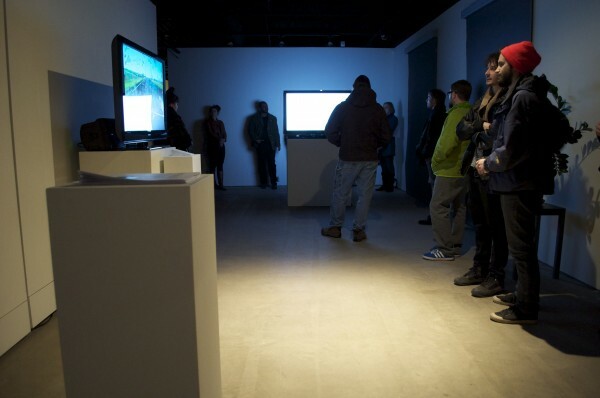 During Sculptiesâ€™ one-night opening, it was easy to forget that, despite being the two-dimensional medium that most closely mimics all the phenomena of the real world, video is still really, really flat. 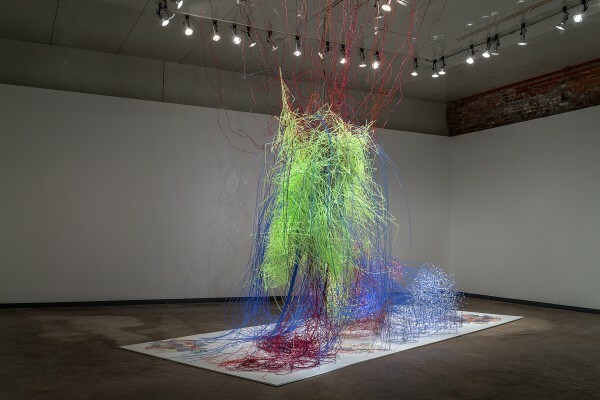 Installation view of “SPECTRA: Sculpties.” Photo credit: H & R Block Artspace at Kansas City Art Institute. Last but certainly not least,Â Scott Dicksonâ€™s solo-show, We Are Not This Body, at PLUG Projects,Â is full of fantasy, providing portholes not just to non-spaces or our own reality, but to another surreally fictional world entirely. Using the transformative medium of collage to transplant peculiar forms from one image into the stage of another, his precise compositions read mostly as landscapes. Yet they are also LEGO-like, monumental science-fictions about humanityâ€™s screen-bound destiny. Scott Dickson, It Was At This Place That We Understood,” 2014. Photo credit: PLUG Projects. 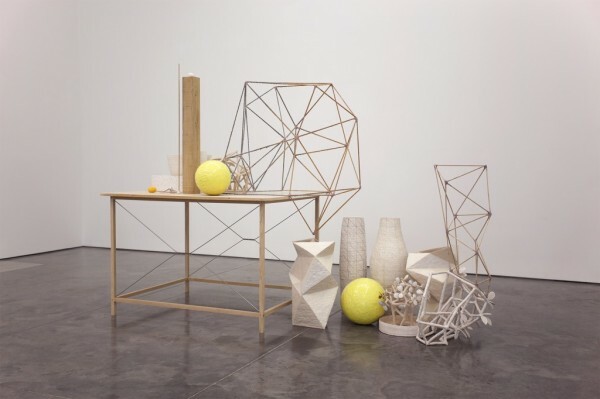 As elucidated by the work in these six shows taken in totality, images of objects and imagistic objects, despite their surface distinctions, are just two sides of the same cyclical conversation. 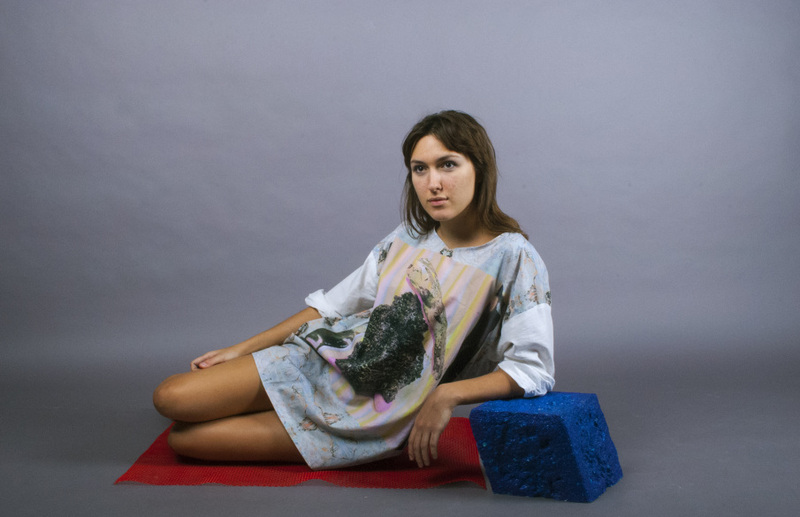 Take the staged picture of Wilkinson in one of her shirts: a ceramic nodule, photographed, printed, sewn, worn, seen anew as an image in your web browser. Screens and substrates (think Antisâ€™ surfaces) are tangible things even though we now primarily â€˜touchâ€™ them with our eyes (as we do with anything in the third dimension, including Neidingerâ€™s plastic abstract-expressionist tornado). It is our inclination to wish that images of our fantasies were real and that whatâ€™s real would fit the images of our fantasies. Itâ€™s a paradox. One that is gaining increasing relevance in proportion to the amount of our daily experience made up of pixels. And as the boundary between what is real and what is like-real continues to dissolve, one thing is certainâ€”the most engaging way to explore these sorts of ideas is through the fluid forum of art.